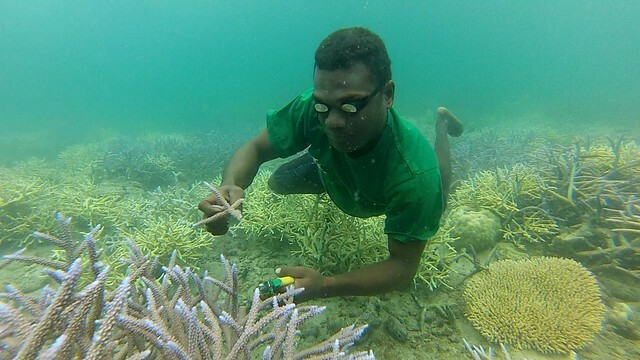 Communities in Solomon Islands are replanting corals to rejuvenate depleted reefs and increase fish stocks. The vibrant coral reefs that surround the 1,000 islands, atolls and islets of the Solomon Islands are home to diverse marine species that support the livelihoods of thousands of subsistence fishers and their families. Coastal communities, which are home to 80% of the country’s population, depend on these fragile natural resources for not only food and income, but also building materials. Coral sand, gravel and stone are commonly used in the construction of houses and sea walls. Coral is also burnt to create lime, which is chewed together with betel nut and is an important local and national commodity. 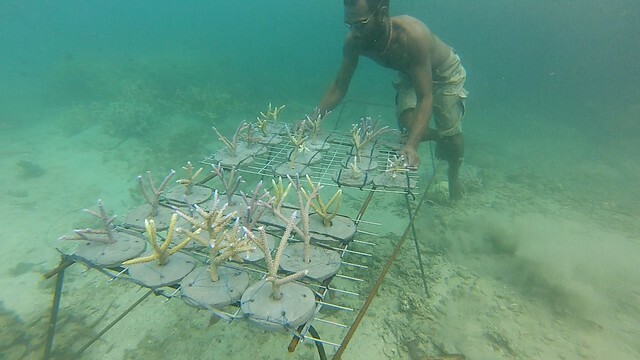 While these uses are important for daily life in rural villages, they are placing stress on coral reefs, many of which are being harvested faster than they can grow. This is in turn reducing populations of fish and other aquatic animals that call coral reefs their home. 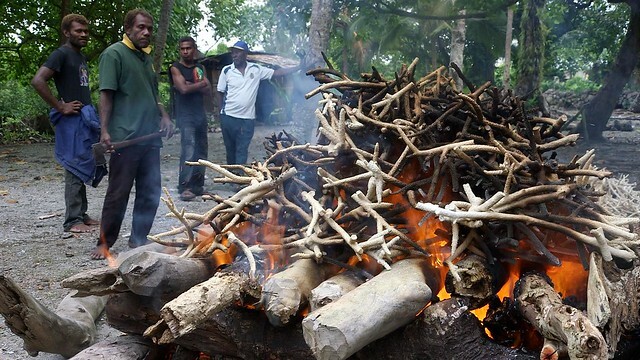 These knock-on effects have been noticed by many fishers in Malaita Province, including Abalolo village elder Victor Walenena, who believes that communities must work together to replant corals to rejuvenate over-harvested reefs and ensure a plentiful supply for the future. “I really support this idea from the bottom of my heart, because in the future lime production will exhaust reefs,” says Victor. “The sea is our garden so it’s much better if there is awareness about coral planting so that we are involved and work hard for the future of our people, especially children. For Langalanga people especially that’s very important for us for our survival in the long term,” he says. This is a key concern for communities in Malaita Province, who are working in partnership with the CGIAR Research Program on Aquatic Agricultural Systems (AAS) to improve their management of marine resources. 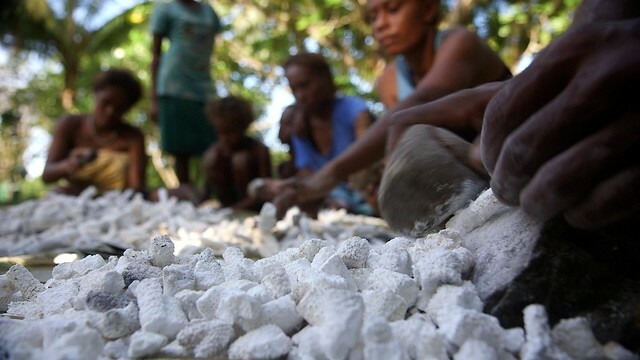 ‘Community-based resource management’, an approach which is supported by the Solomon Islands government, recognizes that community members are the owners and custodians of their resources and so empowers them as stewards. To support communities in their goal to replant coral reefs, AAS through the European Union-funded Ecosystem Approach to Fisheries Management project, worked with community leaders and key resource persons to host a training workshop for more than 30 people in Langalanga Lagoon. During the four-day training participants learned how to collect cuttings from healthy coral and build the structural foundations for a coral garden, including the underwater trestle table and bases to attach the cuttings to. Techniques for maintaining the coral garden and transplanting mature corals to reefs near the lagoon for ‘re-stocking’ were also covered. 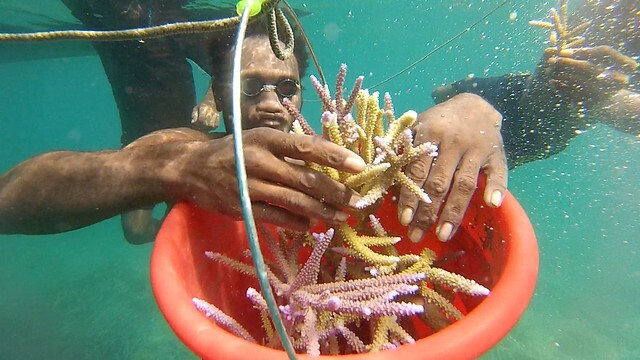 “The training is to give an idea to Langalanga people of how to plant coral because its one way of restocking reefs and encouraging fish to return to the lagoon,” explains Grace Orirana, a WorldFish researcher in Solomon Islands. A further stress on coral reefs in Solomon Islands comes from harvesting wild corals for export to the international aquarium trade. However, AAS research found promising results that more than 80% of coral harvesters would be willing to change practice from wild harvest to farming corals if they receive training and if they could see a financial incentive to culture corals. With coral reefs in Solomon Islands already under threat from factors including climate change and pollution, reducing the environmental pressure of coral harvesting is step towards securing these marine resources for future generations.